I want to know who these consumers are. First of all, I’m not even sure that the idea of putting coffee in these machines is acceptable! These machines, of course, are the single-serve monstrosities like the Keurig coffeemaker that serve up coffee drinks one K-cup at a time. Ugh. Yes, I get it: convenience wins, it makes sense with multiple users like in an office… and well, that’s all I can think of. “These machines” are glorified coffee vending machines. Which brings us back to soup. 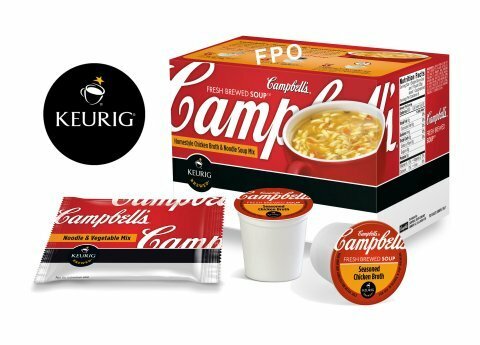 Now, Campbell’s Soup will be available in K-cup form. Stick the soup pod in your coffee maker, press the button and watery soup will be yours to enjoy. If it didn’t happen to be September, I would think this to be an April Fools joke. What, the office doesn’t have a microwave? Ugh. Glad it’s Friday and this thought will be outta my head soon!